OTV MIB | CCIE or Null! Yea, this stuff is great but I can’t monitor this stuff natively in my management systems. How I am going to know when something goes wrong? 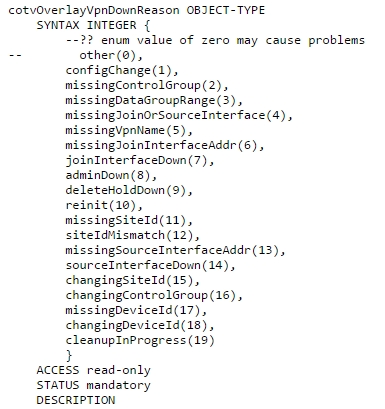 Luckily, Cisco publishes a lot of their MIB structures. For example we can find the OTV MIB File here, this gives us a lot of information and tells us what information is exposed via SNMP. One thing I want to point out is the fact, I was unable this find this using a MIB Browser, “810” just was not listed. In order to find this I had download all the SNMP MIB Tables from one my OTV VDC’s. At this point I am not sure if it was an issue with the SNMP MIB Browser I was using or if it is an NX-OS thing. 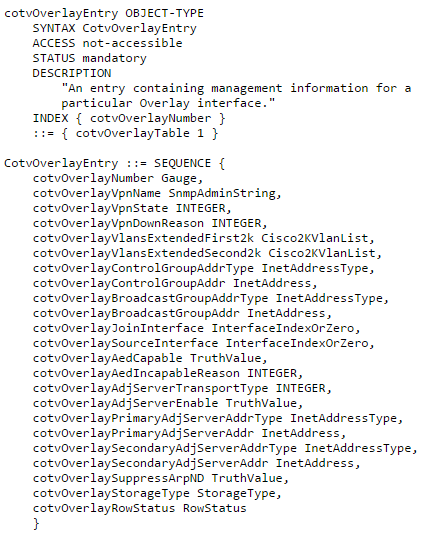 Now, we will want to take a deeper look at what CISCO-OTV-MIB can tell us. We can find this info here. What possible values the OIDs can return and the meaning of those returned values. So this tells us, if this specific OID returns a value of 1 we have problem our OTV Overlay interface is down. We can even go another step further and poll an additional OID to identify the reason the Overlay interface. 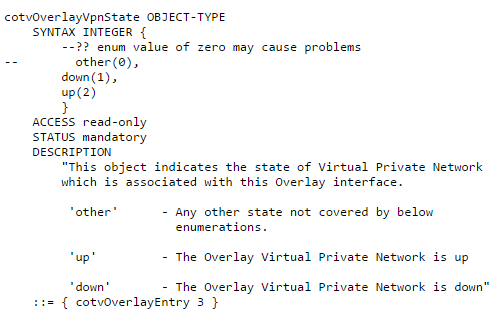 Now, by polling for these specific OID’s in your Network Management Server (NMS) you can much easily get the status of your OTV Overlay interface, and if the Overlay does happen to be down you can also find out why just as quick. Now, that we know how to monitor the Overlay interface that really solves half the problem in my mind. We may also want to monitor OTV Adjacencies, or an AED Status. Information that is also contained in the MIB file to poll the additional data. Another important thing that may be worth monitoring depending on your deployment is multicast. I’ll cover multicast monitoring in a future post, but if your running OTV in multicast mode and you start losing PIM neighbors or mroutes start getting pruned you may definitely have some issues going on.